Artist’s impression of the exomoon—a Neptune-sized moon in orbit around a large Jupiter-like exoplanet. Astronomers have confirmed thousands of planets outside our Solar System, but not a single exomoon. New research is bolstering the case for a suspected exomoon first detected last year, but scientists say the evidence is still not definitive. To date, astronomers have confirmed the existence of 3,851 exoplanets—a surprisingly big number given that the first exoplanet was discovered just 26 years ago. Yet during all this time, and after all those amazing planetary discoveries, astronomers haven’t been able to prove the existence of a single exomoon, that is, a moon in orbit around a planet in another star system. This is a surprising result given that exomoons are guaranteed to be ubiquitous across the cosmos. Take our own Solar System, for example. Our eight planets host 185 known natural satellites. Of these, 79 belong to Jupiter and 62 to Saturn—an embarrassment of riches that showcases the potential of gas giants to harbor large collections of natural satellites. What’s more, a hefty portion of exomoons are likely to be habitable, as argued in a research paper published earlier this year. But we still haven’t found any, despite these predictions. Indeed, exomoons are proving to be frustratingly difficult to detect, and for obvious reasons. Unlike enormous gas giants and super-Earths, moons tend to be on the smallish side. Not only that, they’re spinning around an object that’s also spinning around an object; after a few observations, astronomers can predict when an exoplanet will pass in front of its host star, but knowing when an exoplanet’s exomoon might make an appearance is a different challenge entirely. So it makes sense that astronomers are struggling to make a definitive detection. As some of you may recall from last year, astronomers using the Kepler Space Telescope detected a faint dip in the brightness of a star called Kepler-1625, which was interpreted to be a potential sign of an exomoon. The data wasn’t definitive, but the observation resulted in the astronomers getting 40 hours worth of access to the Hubble Space Telescope. With Hubble, astronomers Alex Teachey and David Kipping from Columbia University were able to collect data that’s four times more precise than what Kepler was able to acquire. 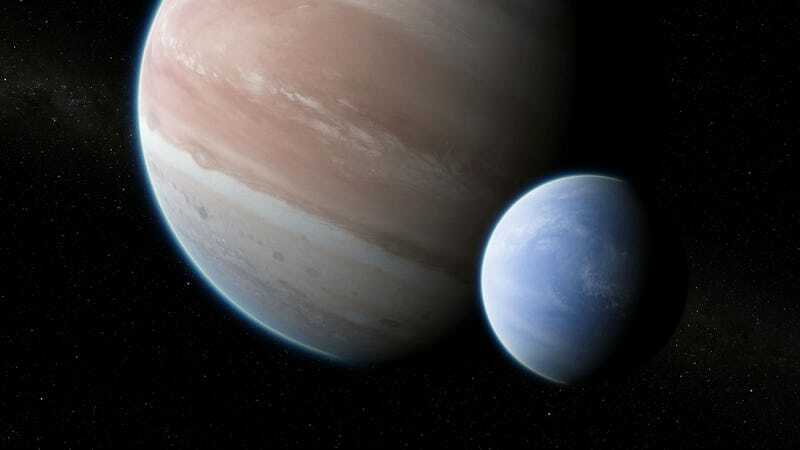 The results of this second survey, published today in Science Advances, is furthering the case for the existence of this exomoon, though, as before, the data is still not definitive. “Our initial report was based on Kepler-data alone, which we always felt was not sufficient to claim a discovery,” Teaching told Gizmodo. There are basically two features of the new data that suggest the presence of a moon. The first of these features is an apparent dip in the brightness of the host star following the planet’s transit, which the astronomers attribute to the exomoon. The alleged exomoon is in orbit around a known exoplanet called Kepler-1625b, a large gas giant that’s several times bigger than Jupiter. It takes Kepler-1625b around 19 hours to travel across the face of its host star from our perspective here on Earth. At 8,000 light-years away, astronomers can’t actually see the planet, but they can detect a drop in the host star’s brightness when it passes in front; it’s this eclipsing effect, called a transit, that allows scientists to detect distant exoplanets. Artist’s impression of the exoplanet Kepler-1625b transiting the star with the candidate exomoon in tow. Around 3.5 hours after Kepler-1625b performed its transit, Hubble detected a second, significantly smaller dimming of the star’s brightness. In a statement, Kipping sait it was consistent with “a moon trailing the planet like a dog following its owner on a leash.” Unfortunately, however, the scheduled Hubble observations ended before the complete transit of the supposed exomoon could be measured. The second observation was the presence of transit timing effects, which indicate the presence of something in the system tugging on the planet gravitationally. Teaching said the moon explanation is superior to other explanations, such as the gravitational influence of an undiscovered exoplanet in the Kepler-1625 system. The exomoon explanation also has the added benefit of being a single explanation for the two observed phenomena. But as Teaching and Kipping admit, the data is still incomplete, and something unknown may be influencing the observations. Regardless, a picture of this exoplanet and moon is beginning to emerge. If this is an exomoon, it’s actually quite large—about the size of Neptune. By comparison, Jupiter’s Ganymede—the largest moon in our Solar System—is 3,270 miles (5,268 kilometers) in diameter, compared to Neptune and its 30,500-mile-wide (50,000 kilometers) diameter. This exomoon is about 1.5 percent the mass of its host planet, which, interestingly, is the same mass-ratio between the Earth and Moon, but on a far less grandiose scale. By the standards of our Solar System, this is a moon of gargantuan proportions—an attribute the researchers say is largely responsible for its discovery. Natalie Hinkel, an astronomer at Southwest Research Institute in San Antonio who wasn’t involved with the new study, was impressed by how the authors vetted their data and analyses. University of Southern Queensland astronomer Rob Wittenmyer said the paper was thorough, and without the authors overstating their claim. David Bennett, a scientist at NASA Goddard Space Flight Center, agrees that additional observations will be required to brand this a definitive discovery of an exomoon. Which is a good point. How is it even possible that this particular planet-moon architecture even exists? If it’s confirmed that Kepler-1625b hosts such a large moon, astronomers will have the added challenge of figuring out how this particular star system took shape. Another neat fact about Kepler-1625b is that its orbit resides within its host star’s habitable zone. Now, it’s very unlikely that this gas giant, and its equally gassy, Neptune-like exomoon, could harbor life. But what if this purported exomoon has its own moons, and those moons are of a terrestrial nature? Could life actually emerge on the moon of a moon? It’ll be awhile before we can start answering these sorts of questions, but this latest observation means we can at least start to pose the questions.